We are wrapping up our Fast Casual Fave’s series for this year with an in-depth look at one of my personal favorites — The Protein Bar. Coincidentally to our Fast Casual series, I was invited to break Bar-ritos with the good folks at the Protein Bar and let’s just say – I learned a lot. working out, committed to a low-carb diet and was successful in his journey to lose weight and become a healthier person. Through this journey, Matt struggled to find ways where he could quickly grab nutritious food in the heart of Chicago and this was a problem. Matt set out to solve that problem by creating the Protein Bar as a place that would offer Chicagoans fast and healthy options during hectic days downtown. Matt’s initial concept for fast-casual nutrition quickly evolved into the place you see today adding salads, wraps (Bar-ritos) and bowls to the blended drinks options. Looking at the menu, you can clearly see that that Quinoa, Kale and Avocado are a few of the differentials that set Protein Bar apart. While the menu is not exactly “low-carb” it IS high protein and offers the right kinds of carbs – like Quinoa and whole grains – so you get the net-effect of a balanced, nutritious meal that is delicious and energizing. The chicken is sourced from Springer Mountain Farms and is all-natural, antibiotic free and raised solely on a vegetarian diet. 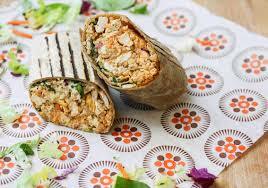 The Protein Bar also uses non-GMO soy products and is committed to working toward a completely GMO-free menu. Beyond offering good proteins and carbs, The Protein Bar is focused on using the most nutritious fats and this comes through with the ever-present Avocado on the menu. Nothing exemplifies this more than the Guac-n-Roll, which we taste tested during our Fast Casual series. The Guac-n-Roll contains fresh avocado, chicken, salsa and the Super 6 Salad mix, layered with house-made Cilantro lime dressing. At the first bite – you can tell that the dressing is made in-house, using fresh limes. 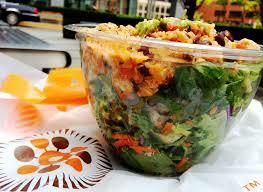 In fact, all of the Protein Bar’s dressings are made fresh, in-house each day. The crisp acidity of the dressing is the perfect compliment to the rich avocado while the crunch of the Super 6 salad balances the creamy texture. And, the chicken is moist, fresh and provides added protein and balance. The tortillas are 100% whole-wheat with an infusion of flax seed and is worth your carb budget for the day. The texture is rich, moist and satisfying. But, you can have too much of a good thing, and I felt that the wrap needed more crunch of the Super 6 salad to offset the generous helping of avocado. I also would have preferred the wrap grilled and slightly crisp. In case you feel the same – here’s a pro tip – just ask when you order. Hospitality and trust are two key components to the Protein Bar’s commitment to outstanding service. When you enter the restaurant, you’ll probably be greeted by a friendly staff member and, if you’re standing in front of the menu for a few minutes, don’t be surprised if someone wanders up and asks if they can help or answer any questions. If you order any vegan item, feel free to quiz the staff on each and every ingredient to your satisfaction. And, if you add anything non-vegan to that order, the Protein Bar staff are trained to look out for these details and will ask if that was your intention. As for the Super6 salad, this may be the one thing that sets the Protein Bar apart and will continue to do so for some time. Our cultural love affair with Kale continues to intensify and, here, it is finely chopped up and well portioned alongside romaine, spinach, broccoli, carrots and purple cabbage. The Super 6 provides dense nutrition when compared to other salads and sandwich toppings but also has a a satisfying texture, providing crunch and balance. When Iordered the Vegan Super 6 salad, it came in such a large size that I figured I would take about half of it home for later – nope! All gone. The Protein Bar prominently displays detailed nutritional information next to each menu item so that you can make the best choice for you and your family.Here’s a great example. When perusing the blended drink menu I came across the Ski-nut Butter and Jelly shake. It’s such a weird and crazy concept yet somehow, right up my alley – peanut butter blended with vanilla protein powder, blueberries and strawberries with a hint of organic agave nectar. Yet – its a whopping 410 calories in a full 20oz serving. The reviews are in and, yes, it is good! I hit up my Protein Bar Sherpa’s about the nutritional value and asked why would someone order this? Well, if this is just a regular day, you can opt to order the snack size, which is about 12oz, an entirely respectable and satiating size with roughly half the calories. Perhaps you are on a cleanse after some overindulgent behavior and need a meal replacement. This is certainly a good and nutritious option. And, here in Boulder, there’s a decent chance that you are in training for a huge competition and actually need that type of well-balanced, nutritious snack or meal supplement. For either of these two options, I’d also recommend the Avo-Macha (387 Cal) or the Pikes Peeled (500 Cal). For a ‘regular day’ there are also several blended drink choices with much lower calorie counts – you can try the Mile-High Perk (210 cal) or the HI-5 (150 Cal). After just getting my head around Kombucha, I haven’t caught on to the cold-pressed juice craze yet. I find that $7 for 12oz of anything in a jar (other than craft beer) is a bit off-putting. But I did get to try this seasons cold pressed Watermelon juice and, yes, it is good. Very refreshing and invigorating. While the Protein Bar used to press juice on order, they realized that waiting 5-10 minutes for your juice didn’t quite fall into the “fast” healthy option. 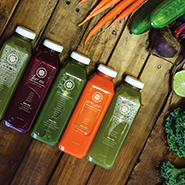 Now, juices are pressed locally at a distribution center and you can grab a bottle and drink it on the go or it will keep for a few weeks in the fridge. The Protein Bar also has an “idea-greenhouse” in Chicago, which is their experimental restaurant. This is where the seasonal soups and menu items are designed and they are even experimenting with on-tap Kombucha. So, if you have an idea, comment or suggestion you think would be great for The Protein Bar just hit up Teddy on @theproteinbar or Facebook page. I encourage all of our readers to engage the staff as much as possible and let us know in the comments how they are doing!